SALE $49.95 MSRP $60 What better way to send a message, Love You More, than with scrabble pieces. 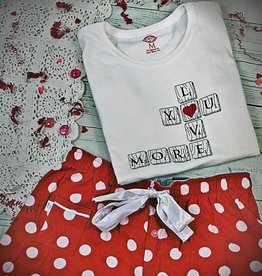 How about scrabble pieces printed on a 100% soft cotton tee paired with a lush, soft pajama bottom. Give the gift of comfort this Valentine's Day.